While her brother and sisters, and the other members of The Corrs took a break from recording and touring, Andrea Corr struck off on her own with some help from Gavin Friday and Bono to put together her own solo album. First titled “Present”, it was retitled “Ten Feet High” by the time of release. There is no performance of either Bono or Gavin Friday credited on the album, and it is not known how much input the two had in this album. In the thank yous of the album Andrea does write, “To my three bodyguards for breathing life into my songs Nellee Hooper, Bono and Gavin Friday. “Shame on You” was released as the first single to promote the album. A second single, “Champagne From a Straw” was only released digitally, and a small number of physical promotional copies exist. No further singles were released from this album. Produced by Nellee Hooper. Executive Producers: Bono and Gavin Friday. 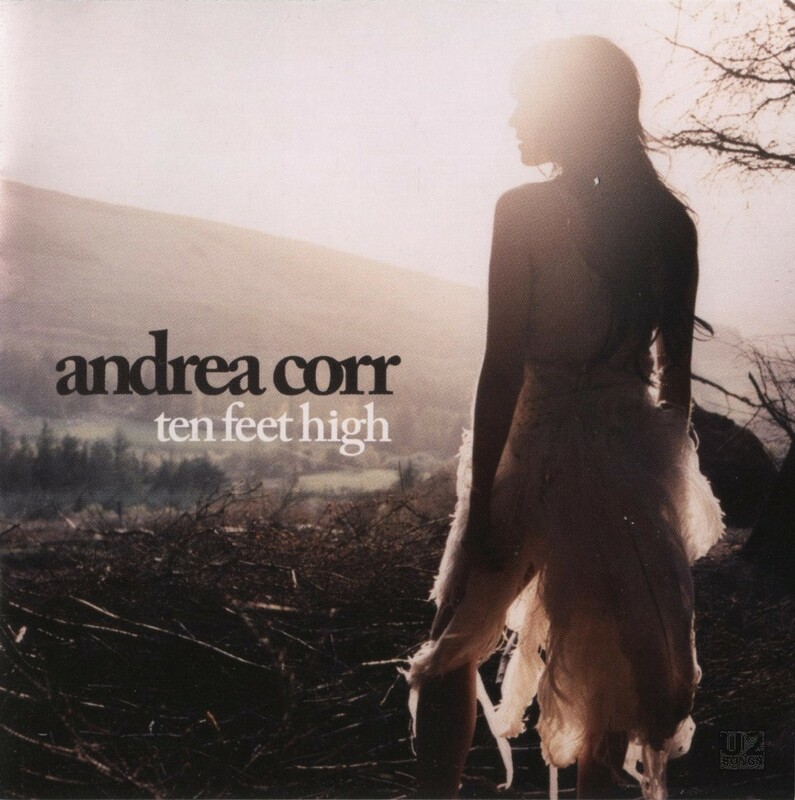 Written by Andrea Corr. Except track 9 written by Chris Difford, Glen Tilbrook. Programming and keyboards by Aidan Love. Recording and mixes engineered by Simon Gogerly. Additional engineering by Aiden Love and Ian Rossiter. Assisted by Ian Rossiter and Owen Clark. Piano by Andrea Corr. Guitars and bass by Mark Ralph. Album recorded and mixed at Home Recordings. Strings on “Ten Feet High” recorded at Abbey Road Studios. Strings on “Ideal World” recorded at Angel Studios. “Shame on You”, “Ten Feet High”, “Shame on You (Radio Edit)”: Drums by Geoff Holroyde. Bass by Vezio Bacci. “Ten Feet High” string arrangement by Anne Dudley. Orchestra: Viola by Nick Barr, Peter Lale, Rachel Stephanie Bolt, Ivo Van Der Werff, Bruce White and Andy Parker. Violin by Roger Garland, John Bradbury, Perry Montague-Mason, SOnia Slany, Boguslaw Kosrecki, Jonathan Evans-Jones, Rita Manning, Dave Woodcock, Everton Nelson, Jackie Shave, Emlyn Singleton, Rose Warren-Green, Debbie Widdup, Mark Berrow, Patrick Kiernan, Rolf Wilson. Cello by Martin Loveday, Dave Daniels, Anthony Lewis, Anthony Pleeth. “Champagne from a Straw”: Trumpet by Dominic Glover, Trombone by Nichol Thompson, Saxophone by James Hunt, Percussion by Satin Singh Bharj. “24 Hours” and “Stupidest Girl in the World”: Drums by Nikolaj Byrne. “Ideal World”: String arrangement by Michael Jennings. Harp by Skalia Kanga, Violin by Kerenza Peacock, Peter Povey, Bejamin Roskams, Edward Brenton, Simon Hewitt Jones, Jenny Sacha, Simon Kodurand. Cello by Louisa Tuck, Oliver Coates. Viola by Felix Tanner, Adam Newman, Natalia Gomes. “Shame on You (Radio Edit)” Additional production and mix by Jeremy Wheatley for 365 Artists at Twenty One Studios, London. Assisted by Richard Edgeler. Additional programming by Alexis Smith for 365 Artists.